Retailers of all sizes are already gearing up for Black Friday and the huge sales opportunities it brings. With millions of pounds being spent during Black Friday every year, retailers can overcome any previous slumps with an effective marketing campaign. Regarded as one of the biggest sales of the year (though not as big as Boxing Day), Black Friday no longer limits itself to a one-day sale, with some brands promoting discounts for the whole weekend, week, or even the whole month. Year on year Black Friday continues to grow in popularity and spend, with sales in 2017 hitting the £2.6 billion mark for the UK (Source: Independent) and $14.5 billion in the United States (Source: Adobe). 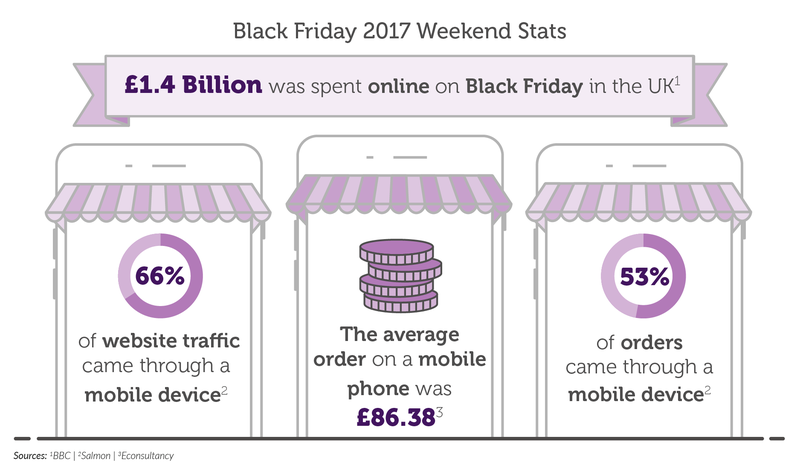 As our Black Friday infographic suggests, it’s important to understand how consumer behaviour can be influenced by good mobile marketing. We’ve come up with our 4 top tips to help you get the most out of SMS for your promotions this year. With 53% of purchases coming through a mobile device last year, driving traffic to your website is key to a successful sale. There’s no better way to notify customers about your promotion and get them to your site than a text message. Its 94% open rate presents you with a fantastic opportunity to let your customers know how much they could save and how they can claim it. You may have found that since the onset of GDPR, your marketing database, although tidier and compliant, is not as big as it was previously. There is no better time to grow your subscriber list than when consumers are expecting something big around the corner. A simple form on your website where users can opt-in to your marketing or you could use a keyword to allow customers to opt-in with a text message. The keyword could be shown in a banner on your website, in your store, or on printed material. Keep customers informed about what stage their order is at and where their order is. Even the biggest brands can struggle with the demand on Black Friday; few customers will be expecting next day delivery but managing expectations is key to happy customers. Using SMS as a notification method as well as email means your customers are more likely to see and read the message, with email having an open rate of only 25% (Source: Smart Insight) compared to SMS at 94%. Sales don’t last forever and customers don’t want to miss out. The best way to close some last minute deals is to drop customers a reminder that their time to claim the offer is running out, encouraging customers to complete a purchase before the items in their basket sell out completely. There is no one single secret to a great Black Friday campaign, but keeping customers up to date and informed using SMS is a highly effective way to increase your Black Friday sales. Hi, I'm James, I am a Marketing Executive for Esendex. I am passionate about all things marketing and have an extensive knowledge of SMS marketing. I have worked closely alongside big brands to implement and manage SMS campaigns.